Delicious healthier version of the twice baked potato made with sweet potatoes, rosemary/sweet potato cashew cream & lemon-dressed broccoli. Vegan option. 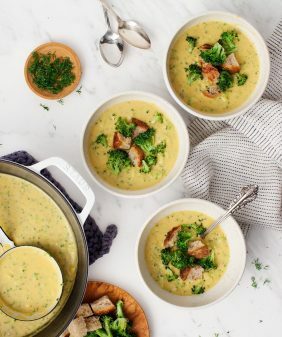 Back in college when I first started incorporating more vegetables in to my life, my go-to vegetable was broccoli. I’d throw it on everything – broccoli on pizza, broccoli in pasta, broccoli stirred into my stir fry. Then one day the world went crazy for kale, and I feel like broccoli got left behind. It’s so humble and hearty, yet folks always seem to forget about it. It’s not winning awards for the trendiest vegetable, but who knows? Maybe 2017 will be its year in the spotlight? I love these twice baked sweet potatoes because they’re at least twice as healthy as any version I’ve eaten before. They’re made with nutrient-dense sweet potatoes and stuffed with broccoli. I made a creamy cashew sauce by blending some of the baked sweet potato mash with creamy cashews and rosemary. Before I baked it all, I lightly steamed the broccoli and tossed with lemon, dijon mustard, and scallions. More of that creamy sweet potato sauce goes on top. 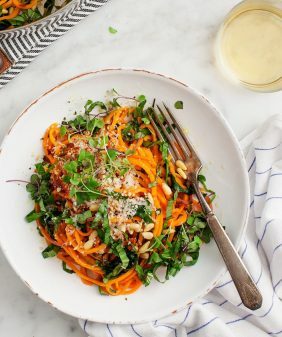 Make the Sweet Potato Cashew Cream: In a high-speed blender, combine the water, sweet potato mash, cashews, lemon juice, garlic, rosemary, salt and pepper and blend until smooth. Set aside. 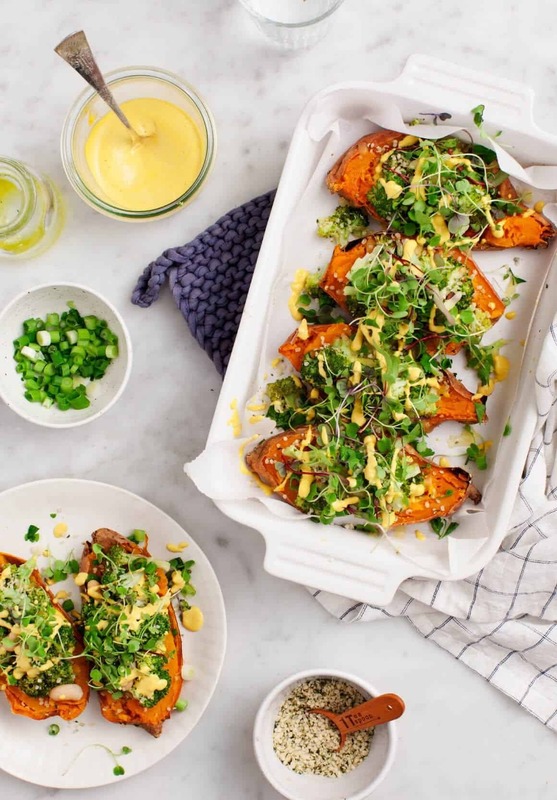 Fill each potato half with a scoop of the cashew cream, some of the cheddar cheese (if using), the broccoli mixture, more cheese, scallions and sprinkle with the hemp seeds. Bake for 10 more minutes or until the cheese is melted. Garnish with the parsley and/or microgreens and serve with the remaining cashew sauce for drizzling. (tip: if your cashew sauce is too thick to drizzle, stir in a little bit of water until it's a thinner consistency). Officially found my contribution to the family Thanksgiving feast this year. Ill shoot you a shoutout when I post it on Yobored.com and make all my friends jealous. Ha, let me know how you all like it! Happy Thanksgiving! We are big fans of sweet potatoes, especially mashed. On an excessive day like Thanksgiving, with so many dishes on offer, it’s hard to eat a whole half of one. They’re big! This looks like a hearty side dish or a light dinner unto itself. BTW, broccoli is not only delicious but full of calcium. I love eating Broccoli and Sweet Potato. The dish and its recipe is quite outstanding. The dish is healthy and tasty. The pictures of the dish telling story of the cooking itself. Thanks for providing the info. I will make it and enjoy it. The combination of the two main vegetable is really superb. Kashish Food, Pulses importer in Auckland New Zealand wishes you best complements. I’m a complete broccoli fan!! I love the sound of recipe, I must give it a try! Wow, I can tell this is one of those dishes that’s so much more fun and complex flavor-wise than it seems. Really clever recipe Jeanine. 😉 Must try!! Very creative sweet potato mash-cashew cream! 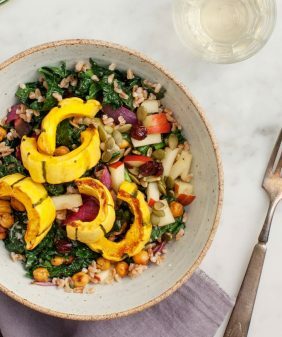 This looks wonderful and a nice post-thanksgiving healthy boost! thank you! I’m wondering if one could use cashew butter as a shortcut for both the soaking and the blending….would that work? Thanks! If it were raw, unsalted cashew butter that could work (so that it doesn’t taste like cashews in the end). I’m not sure of the ratio – you’d still want to add some water and blend it to be creamy. im wondering about the knitted pot holder/trivet under the pan. did you do it? what is the fiber? i love how it looks cotton-ish but super thick. I got it in Norway, the brand says “kid” and the fabric says “bomull” (which I think means cotton?). This looks great and super good for me too. I think I will whip them up with the wild salmon my husband ( a chef) caught on a fishing trip in the Pacific Northwest. Thank you. I tried it with white potatoes as well. It’s amazing both ways. As much as I really do love kale, I haven’t abandoned broccoli or all the other lovely veggies of the world. 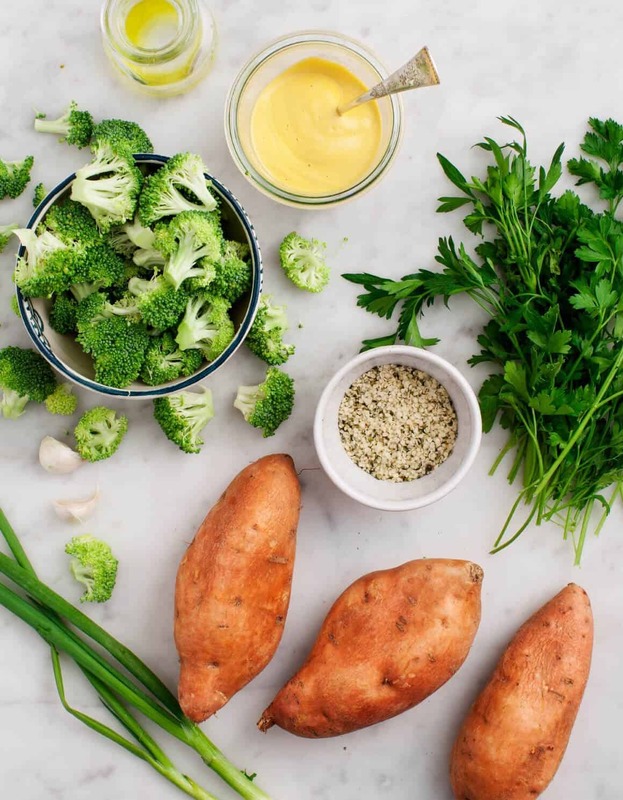 I love how you paired the broccoli with a baked sweet potato and the sweet potato cashew cream, oh my. 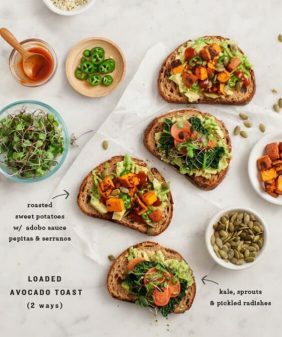 Lately, I’ve been adding cashew cream to almost everything, but never thought to mix in some sweet potato, genius, my wheels are turning now thinking of all the other possible add ins, yum…. 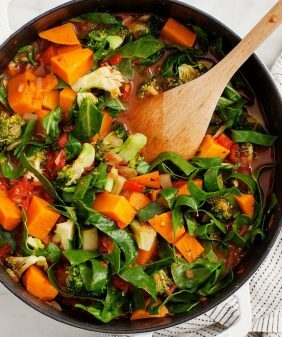 Two favorites broccoli and sweet potatoes!!! Since i made sweet potatoes soup, im totally in love. definitely must try this! Hi Heather – ok I’ll keep that in mind if we do more videos! In the Vitamix, I just blend until it’s really really smooth – add a little extra water if you would like the consistency a little thinner. To get the cashew sauce to drizzle at the end, I just stirred in extra water until it’s a drizzle-able consistency. Hope that helps! I find that boiling the cashews for a few minutes gets them even softer than soaking them (plus it’s much quicker in a pinch). What would you substitute for cashews for those with nut allergies? 🙂 Thanks! Hi Lavanya, you can use raw sunflower seeds! 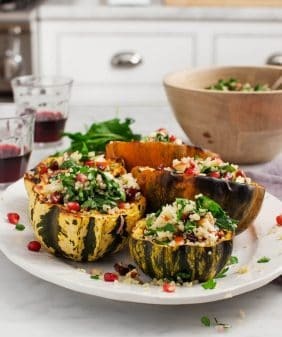 Do you think you could freeze this recipe before adding the scallions/hemp hearts and bake the day of? I can tell this is one of those dishes that’s so much more fun and complex flavor-wise than it seems. I absolutely love this recipe. It has become one of our staples! My husband is obsessed with the cashew cream sauce and we have used it on multiple other dishes. We leave out the cheese to make it vegan and it is still hearty and delicious. It’s excellent to prepare ahead of time and heat up at work as well. Oh my goodness this is amazing!! When I first tasted the cashew cream I looked around my empty kitchen and ended up telling the dog that it was soooooo good because I just had to say it out loud! This will definitely be a recipe I save because it’s an easy, delicious vegan meal that is really filling. Thank you SO much for posting this! 🙂 Just a side note: If you have a Vitamix, you don’t really have to soak the cashews first. I ended up soaking them just while the potatoes cooked and it came out perfect.